CAMP RUPERTO K. KANGLEON, Palo, Leyte – The Regional Special Operations Task Group (RSOTG) will showcase its accomplishment in the campaign against Partisan Armed Groups (PAGs) operating in Samar province during the visit of Police Director General Alan La Madrid Purisima, Chief of the Philippine National Police, scheduled on Saturday morning, January 19. “Aside from activities targeting the humane and spiritual side of the candidates and the electorate like the successful peace covenant signing in Samar and the unity walk and prayer rally for SAFE 2013 on Sunday, we will also showcase the result of aggressive police operations targeting PAG personalities in Samar and loose firearms in other parts of the region,” said Police Chief Superintendent Elmer Ragadio Soria, director of the Police Regional Office 8 (PRO8). Soria added that accomplishment only goes to show that PRO8 is serious in the crackdown against PAGs and in ensuring “secured and fair” elections in Eastern Visayas. To recall, a successful peace covenant signing was initiated by PRO8 held last January 13 at the Saints Peter and Paul Cathedral in Calbayog City with Department of Interior and Local Government (DILG) Secretary Mar Roxas presiding and garnering support from the Diocese of Calbayog and other stakeholders like the DILG, Commission on Elections, Armed Forces of the Philippines, civil society groups and signed by local candidates vying for different congressional and local elective posts. The PRO8, in collaboration with the Commission on Elections will also conduct a “Unity Walk and Prayer Rally for Secure and Fair Elections (SAFE) 2013 on Sunday, January 20, in Tacloban City and provincial capitals regionwide to drumbeat the significance of the midterm elections. On the otherhand, PRO8 activated the RSOTG-Samar after the province was included in the list of 15 “priority areas” for the May 2013 polls. The task group, led by Police Senior Superintendent Edgardo O. Basbas, Acting Deputy Regional Director for Administration, is tasked in the crackdown against the Montealto and Moloboco PAGs operating in Samar and the campaign against the proliferation of loose firearms. Recent major RSOTG accomplishments include the neutralization of PAG leader Julito Aragon y Cachero alias Nonoy on December 23, 2013 in the hinterlands of Brgy. Peñaplata, Gandara, Samar. Aragon was listed as the Number One Most Wanted Person in Samar province and wanted for two counts of murder. Also, two Montealto PAG members, Michael Angelo Mendoza and Felipe Casaljay, voluntarily surrendered to RSOTG last December 20 and 27, 2012 respectively while Wilfredo Moloboco of Moloboco PAG also turned himself in last December 19, 2012. These accomplishments are aside from the assorted firearms recovered by RSOTG in police operations against loose firearms, the regional police chief added. Soria earlier assured that he will ensure that the will of the people is truly reflected in the upcoming elections, even recalling his successful experience as Commander of Task Force: ABRA during the 2010 national and local elections that ensured a peaceful conduct of elections in said province, then considered as “election hotspot” due to the presence of political warlords and heavily armed PAGs. 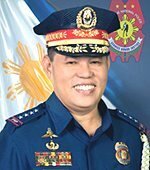 Police Director General Alan La Madrid Purisima, a member of the Philippine Military Academy “Dimalupig” Class of 1981, took over the reins of the 148,000-strong Philippine National Police last December 18, 2012 as its 18th chief since PNP was formed in 1991. The PNP chief was a former aide of the late President Corazon Aquino, among other key posts he held in the police force, including being the former director of the National Capital Region Police Office (NCRPO). “Alam ko po na mas mabigat pa ang haharapin nating pagsubok sa mga susunod na araw lalo na sa paghahanda para sa isang matapat, maayos at mapayapang halalan sa Mayo 2013. Ako po ay nananalig sa ating organisasyon na kaya nating gampanan ng mahusay ang ating adhikain. “Serbisyong Makatotohanan!” Iyan ang ating inspirasyon para sa darating na halalan”, Purisima said in his assumption speech. PASAY CITY – Senator Chiz Escudero said he expects the human rights reparations bill to be approved by the bicameral conference committee next week. The Human Rights Victims Reparation and Recognition Act of 2012, which seeks to indemnify victims of human rights abuses during the Marcos regime, states that any qualified victim shall receive compensation from the state free of tax. The amount of compensation shall be in proportion to the gravity of the violation committed. “If a victim died or has gone missing, it receives the highest points, from 7 to 10 points. If the victim was tortured or was sexually abused depending on the evaluated gravity, I think 3 to 7 points. The amount really depends on how many claimants there are,” Escudero explained. Escudero, chairman of the Senate Committee on Justice and Human Rights, said members of the bicameral committee are just ironing out issues on claimants in the US Federal District Court of Honolulu, Hawaii. The Hawaii court ruled in favor of the claimants. A P10-billion fund, plus accrued interest, has been set aside and appropriated to fund the claims. The amount is part of the funds transferred to the Philippine Government by the Swiss Federal Supreme Court and is now held in escrow. “It’s a long and emotional process. It’s emotional because some members of the committee were also victims themselves. But we are getting there. We just have to settle the issue whether the Hawaii claimants shall be extended the conclusive presumption that they are victims of human rights abuses and therefore are automatically compensated or they be given the disputable presumption,” the senator said. Disputable presumption means a presumption that can only be refuted by specific controverting evidence. Conclusive presumption, on the other hand, means that any person who has secured or can secure in one’s favor a judgment or award of damages from any court in the country arising from human rights violation shall be considered conclusively as a victim without need of further proof. Escudero said the bill provides for the creation of an independent and quasi-judicial body to be known as the Human Rights Claim Board which will determine and evaluate claims. “Since this is a public fund, the board is subject to the auditing rules of the Commission on Audit and the government’s existing rules on public funds. We specified a time-frame for the board to finish and wrap up its mandate in two years. They shall complete their work by then,” Escudero said. Thus said rights group Hustisya as the appointment of Lt. Gen. Emmanuel Bautista as new AFP chief takes effect today. According to Cristina Guevarra, Hustisya secretary general, it is not a surprise that the government will appoint the brains behind Oplan Bayanihan, as the government targets to quash the so-called armed threats this year. “We were not wrong when we warned that more human rights violations will come when Lt. Gen. Bautista was appointed Army chief in 2011. We closed the year 2012 counting more victims. A hundred more families of those extrajudicially killed are seeking justice, while more persons face trumped-up charges and illegal arrests,” Guevarra said. Karapatan documented 137 victims of extrajudicial killings by the end of 2012. “Can our families still hope for justice when the new AFP chief will only direct his men to implement the same old counter-insurgency program, only with a different name?” Guevarra asked. Oplan Bayanihan, according to Hustisya, is a "cut-and-paste" Filipino version of the US counter insurgency guide released in 2009. “After two years, Oplan Bayanihan cannot hide behind pro-people and pro-human rights slogans, not even with music videos that sing of peace and development. In its two years, Oplan Bayanihan is a repeating nightmare of Gloria Macapagal-Arroyo’s Oplan Bantay Laya, which makes anybody vulnerable to rights violations,” Guevarra explained. “We witnessed their increased military presence in communities, and questioned their defense for government projects such as large-scale mining, logging and plantations. We can only find peace if Oplan Bayanihan is put to a stop,” Guevarra ended. QUEZON CITY – Peddled as Oplan Bayanihan’s brains, Lt. Gen. Bautista’s appointment as the new AFP Chief of Staff “signals the escalation of human rights violations” under the Aquino government, Karapatan said today. “Oplan Bayanihan, despite its ‘people-centered’ and ‘respect for human rights’ catch-phrases already resulted in 137 incidents of extrajudicial killings and 154 cases of frustrated extrajudicial killings (as of Dec.30,2012). Contrary to claims by the Aquino government and the AFP, Oplan Bayanihan is no different from Gloria Arroyo’s Oplan Bantay Laya,” said Cristina Palabay, secretary general of Karapatan. Palabay added that it was Bautista’s Oplan Bayanihan that claimed the lives of Italian missionary Fausto Tentorio, Dutch aid worker Willem Geertman, and indigenous peoples’ leaders Jimmy Liguyon and Juvy Capion, among others. Karapatan maintains that a counterinsurgency program such as Oplan Bayanihan and genuine respect for human rights are contradictory. Oplan Bayanihan, in its two years had caused numerous cases of human rights violations, victimizing members and leaders of progressive organizations, including innocent civilians suspected of being members or supporters of the New People’s Army. “There are still incidents of bombings and indiscriminate firing, the use of schools, chapels, medical facility and other public places for military purpose. People are still forced to leave their homes because of military atrocities in their communities,” Palabay said. Karapatan also noted an increasing number of illegal arrests and detention on the basis of trumped-up charges. In December alone, Karapatan documented 27 people arrested, 16 of them are still detained. “Let us not forget the case of Rolly Panesa, a security guard who is currently detained because the AFP insists that he is a high CPP official. That’s how arbitrary the AFP is under Oplan Bayanihan,” said Palabay. “Oplan Bayanihan which is authored by Gen. Bautista is simply the Filipino version of the US Counterinsurgency Guide released in 2009.” she added. Karapatan reiterates its call to junk Oplan Bayanihan. MANILA – Environmental group Greenpeace today welcomed the Department of Environment and Natural Resources’ (DENR) recent moves to address water pollution in the Philippines but said that the government agency must do more to save the country’s polluted water bodies. Greenpeace said that the first step must be pollution disclosure, or mandatory reporting by factories about the chemical waste produced by their operations. “Designating Water Management Quality Areas (WMQA) to some of the country’s rivers and waterways is a good move. But we need to see bigger steps in pollution prevention if the DENR is serious in fulfilling its mandate to keep our waterways clean,” said Abi Aguilar, Toxics Campaigner for Greenpeace Southeast Asia. “We urge DENR Secretary Ramon Paje to immediately eliminate chemicals already identified as hazardous and implement pollution disclosure for companies that dump their wastes and by-products in our bodies of water,” she added. Water pollution is one of the biggest problems affecting the Philippines. According to the DENR, as many as 50 of the 421 rivers in the country are already considered “biologically dead.” Biologically dead rivers no longer contain any oxygen and cannot support any but the hardiest kinds of species. This situation has prompted the government agency to identify eight rivers as Water Quality Management Areas, in pursuant to the Clean Water Act of 2004 – an important step in protecting river systems. Rivers under protection include the Sinocalan-Dagupan river system in Pangasinan, the Marilao-Meycauayan-Obando river system and areas within the Laguna Lake Development Authority’s jurisdiction in Luzon, the Tigum-Aganan watershed and the Iloilo-Batiano river system in the Visayas, the Silway River and the Sarangani Bay in Mindanao, the San Juan River system in Metro Manila, and most recently, the Taguibo River in Agusan del Norte. Greenpeace believes that the fact that these rivers were declared as WQMAs means that its present condition requires serious protection and management action by its local government and stakeholders. Greenpeace has long called for the establishment of a Pollution Release and Transfer Register (PRTR) policy that would also give communities and other stakeholders the right to access information about these pollutants. PRTR policies have been instrumental in preventing pollution in countries like Japan, Australia and Canada. Currently, the DENR has no complete data on what chemicals factories are discharging into our rivers and lakes. Communities living around these bodies of water suffer because they do not know what chemicals are present in their locality, and how their water supply is slowly being contaminated. “Now is the time for Secretary Paje to identify and investigate the pollution hotspots in our river systems. If a PRTR is in place, then industries/facilities would be more careful with their discharges into our waterways. This is an important first step in the elimination of hazardous chemicals in manufacturing operations and ensuring public safety,” Aguilar said. c. Immediately set up a PRTR so that the public can access data on pollution. Greenpeace also calls on the communities to be vigilant about the operations of the industries in their localities, to protect their own rivers, and to call on the government for better policies for cleaner and safer water. 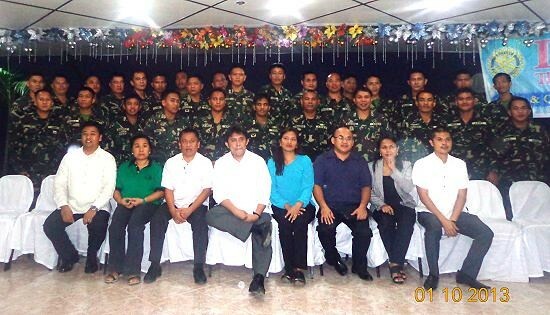 ORMOC CITY – A total of 32 key personnel from the 19th Infantry Battalion and nearly 60 policemen in Ormoc get free seminar on Election Laws at Ramona Banquet Hall, New Pongos Hotel, Ormoc City January 10, 2013. The whole day activity which started 8:00 a.m. on Thursday was hosted by the Occidental Leyte Bar Association (OLBA), COMELEC-Ormoc and the Rotary Club of Ormoc in their initiative for a secured and fair election come May 13 this year. During the seminar, PSSupt. Elizar P. Egloso, police director of Ormoc City Police Office cited the importance of the lectures to both police and soldiers who will be securing the upcoming elections. “We must accept the fact that our knowledge about the law is limited”, Egloso stressed. The seminar includes lectures and open fora to topics such as the Role of AFP and PNP in election activities, Election Offenses and Warrantless Search and Seizures. To Lt. Col. Jeffrey Cabansay, the executive officer of 19th IB, secure, fair and honest election would mean proper implementation of the COMELEC resolutions and election laws by the COMELEC and its deputized agencies. Cabansay furthered that the public should likewise be informed on the election laws. On the other hand, Lt. Col. Joel Alejandro Nacnac, commanding officer of 19IB expressed his gratitude to OLBA and the Rotary Club of Ormoc for orchestrating a very meaningful and educational opportunity for his troops to be re-oriented on their critical role during elections. Election period, as embodied in COMELEC Resolution No. 9385, will start on Monday, January 13, 2013 and will end on June 12 this year. Within this period, the AFP and PNP will be working hand in hand in conducting routine check points and providing security in polling places during the election day particularly in identified election hotspots throughout the country. Martial Law victims to bicam: No more delays, enact “pro-victim” bill now! QUEZON CITY – Martial Law victims held a rally outside Batasang Pambansa on Thursday while the bicameral conference committee “harmonized” the Lower House and Senate versions of the bill to indemnify victims of martial law to craft the final version into a law. “We are here to press our senators and congressmen to stand by the bill most acceptable and reflect the interests of the majority of the victims of Martial Law,” said Marie Hilao Enriquez, whose group, SELDA, initiated the filing of the historic class action suit against the Marcoses in the US Federal Court System in 1986 and won a favorable ruling in 1992. SELDA stressed that members of the BiCam must consider the voices and interests of the victims embodied in the four points the organization asked to be included in the final version of the law. The first BiCam meeting resulted into debates which the victims felt were only moves to delay the passage of the bill, just before the 2013 elections. “We reiterate that victims who filed a class action suit against Marcos in Hawaii must be conclusively presumed as legitimate human rights violation victims and must be acknowledged as such so that they will not be made to once more prove their legitimacy as human rights violations victims during martial law, just like the “new claimants” who will be filing claims for the first time under Philippine law Instead of instantly casting doubts on the victims, the law should prioritize that victims need recognition and reparation or indemnification as components of justice that victims long deserved,” Enriquez said. The group has earlier expressed disappointment on Sen. Joker Arroyo’s insistence of a provision on disputable presumption of the martial law victims who filed and won a case vs. Marcos in Hawaii. SELDA also said that only considering as human rights violations victims during martial law those who “peacefully exercised their rights against the dictatorship” is clearly excluding those who resisted the violations during the white terror years and sends a very dangerous signal to the perpetrators of human rights violations that the perpetrators can do what they like to people considered as not “peacefully” exercising their civil and political rights. This provision also opens up a problem of who will and how will the “peaceful” exercise be determined. Further, even the UN Declaration of Human Rights, which the Philippine government subscribes to, does not specify how the rights will be exercised. “Why should this be an issue when the rights to take up arms in a time of tyrannical rule are enshrined in the Universal Declaration of Human Rights? Pushing for such a provision in a law meant to render a component of justice to martial law victims will deny such Martial Law heroes and martyrs as Emman Lacaba, Edgar Jopson, Lorena Barros, and a hundred more who have been recognized as worthy of emulation by Bantayog ng mga Bayani and most importantly, in our nation’s history,” she said. DILG Secretary Mar Roxas delivering his message while Police Chief Superintendent Elmer R. Soria, Regional Director of Police Regional Office 8 (right photo) signing as witness during the election peace covenant signing in Calbayog City last Sunday morning. CAMP RUPERTO K. KANGLEON, Palo, Leyte – The signing of a peace covenant by local candidates in Samar is a step in the right direction and could usher a “secured and fair” conduct of the midterm polls in the province, said the region’s top police official. “The positive support we got from the candidates themselves and the good number of people who attended the peace covenant signing only showed that Samareños are supportive to our effort in ensuring the conduct of a peaceful and orderly elections,” said Police Chief Superintendent Elmer Ragadio Soria, Eastern Visayas police regional director. The Police Regional Office 8 (PRO8) initiated the conduct of peace covenant signing held Sunday morning at the Saints Peter and Paul Cathedral in Calbayog City that garnered support from the Diocese of Calbayog and other stakeholders like the Department of Interior and Local Government, Commission on Elections, Armed Forces of the Philippines, civil society groups and signed by local candidates vying for congressional and different local elective positions. Department of Interior and Local Government (DILG) Secretary Mar Roxas presided in the activity with Soria and other leaders from the church, military, Comelec and other stakeholders as witnesses. “Kinikilala po ng pamahalaan ni PNoy na ang halalan ay sentro ng ating demokrasya, vox populi vox dei, na ang voice of the people is the voice of God, sana po ay maging maayos at mapayapa ang halalang ito…. Hindi po gagamit ng puwersa ang gobyerno upang baliin ang kagustuhan ng ating mga mamamayan,” Roxas said in his message. Diocese of Calbayog Bishop Isabelo Abarquez officiated a pontifical mass followed by the signing proper of the manifesto, blessing of peace covenant and release of white balloons and doves as a symbol of peace led by the Bishop. Samar was included in the DILG list of “priority areas” due to election-related violent incidents in past electoral exercises, presence of private armed groups and New People’s Army in the area. Even with the covenant signing, Soria assured that PRO8, through the Regional Special Operations Task Group (RSOTG) will continue to conduct aggressive police operations against the remaining PAGs operating in the province and intensify the campaign against loose firearms. “To ensure a ‘Secured And Fair Elections (SAFE)' in the entire region, we will implement sustained law enforcement, security and public safety operations before, during and after the elections,” Soria informed. TACLOBAN CITY – Two civil society organizations recently forged partnership with the Department of Social Welfare and Development in order to serve about 5,000 poor families in Eastern Visayas with children 0-14 years old, who are in need of special protection. DSWD Region 8 Asst. Regional Director for Operations Nestor Ramos informed that the partnership is in line with the implementation of the Modified Conditional Cash Transfer Program for poor households that are not beneficiaries of the Pantawid Pamilyang Pilipino Program in Eastern Visayas. ARD Ramos identified the CSO partners as the Magbinuligon Parents Association, Inc. of Dulag, Leyte and Hinunangan Family Development Center, Inc. of Hinunangan, Southern Leyte. The MPAI will operate in six municipalities of Leyte, namely, Dulag, Tolosa, Julita, Mayorga, Tabontabon and Dagami. MPAI President Marina Duan informed that the organization is targeting to serve 2,350 beneficiaries in the municipalities of Dulag, Tolosa, Julita and Mayorga, and 2,250 beneficiaries in the municipalities of Tabontabon and Dagami, all in the province of Leyte. On the other hand, Ms. Aida Tagnipez, the Chairman, said the Hinunangan Family Development Center, Inc. has targeted 357 beneficiaries in 14 clustered barangays of Hinunangan, Southern Leyte. The target beneficiaries are poor families with children 0-14 years of age and who are in need of special protection in the following categories: street children and families in pockets of poverty who are not covered by Pantawid Pamilya and are not in the list of the National Household Targeting System for Poverty Reduction. These include families who are Indigenous Peoples, families with children with disabilities, families of child laborers and families that are displaced due to man-made and natural disasters. The project of the CSOs which will be funded by DSWD, will augment the limited number of the local DSWD staff in the implementation of the program. MPAI was allotted more than P3 Million for the implementation of the project while HFDCI was allotted more than P2 Million. The partner CSOs are responsible for the facilitation of referral services and case management of beneficiaries. Moreover, the CSOs will also conduct trainings and counseling sessions for the beneficiaries. Like the Pantawid Pamilya Program, beneficiaries of MCCT will also receive cash grants provided they comply with the conditions required such as weekly attendance to FDS for the first two months; once a month attendance to FDS for the succeeding months and family counseling sessions; attendance to Alternative mode of learning or formal schools; visit to health centers; and residing in a permanent home after six months of social preparation. During the MOA signing, ARD Ramos explained the terms of reference for the implementation of the program, the transfer of funds to partner CSOs, and all other conditions and information required by the Commission on Audit from the CSOs pursuant to Item 4.5.3 of COA Circular No. 2007-001 or the Revised Guidelines in the Granting, Utilization, Accounting and Auditing of the funds released to Non-Governmental Organizations/People’s Organization (NGOs/POs). Since they will be handling public funds, partner CSOs will be required to maintain a separate savings account for each project fund they receive from the DSWD, ARD Ramos underscored. In choosing partner CSOs, the Regional Selection Committee composed of DSWD, NEDA and PIA officials, looked for criteria such as a good track record on projects for street families and other families in need of special protection, registration or license to undertake projects and accept contracts, a specialized staff to handle families with special needs, an established office in the city or municipality where the project will be implemented, and documentation procedures (case management) and on-file case records of families and/or children in need of special protection. All these will ensure the proper and successful implementation of the project, ARD Ramos added even as he encouraged other qualified CSOs to partner with DSWD in the implementation of the government’s poverty alleviation projects.